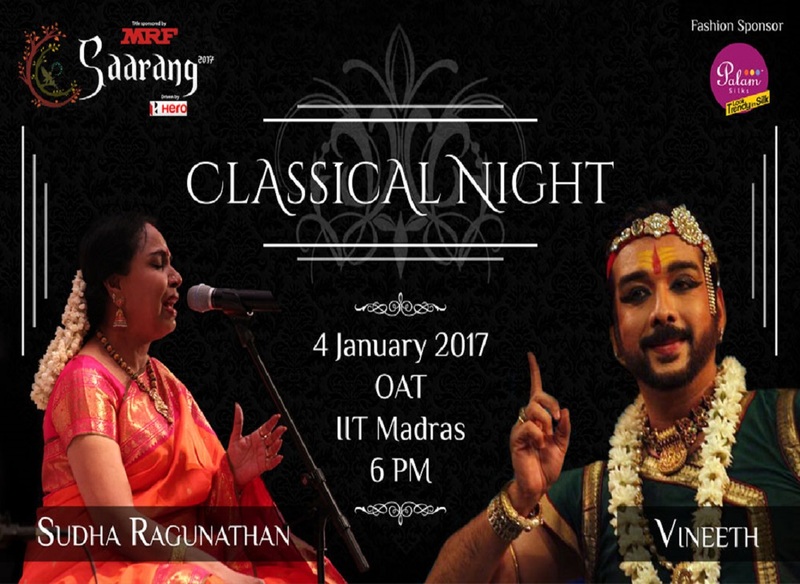 Sudha Ragunathan is a Carnatic Vocalist from Tamil Nadu. She has received multiple prestigious awards including Padma Bhushan and Sangita Kalanidhi Awards. Sudha has performed a range of concerts and festivals worldwide, and has released over 200 albums with leading recording companies like AVM, INRECO, Vani and Amutham. She is a top ranking artist for Prasar Bharati, All India Radio, and the Doordarshan. She has just recently performed at the United Nations General Assembly in New York to commemorate International Non-Violence Day. Vineeth is a south Indian film actor and a classical dancer known mainly for his works in Malayalam and Tamil films. Some of his notable films include Chandramukhi, Kadhal Desam, May Maadham, Gentleman and Bhool Bhulaiyaa. He has performed in the prestigious Soorya Festival in Thiruvananthapuram and the renowned Bharat Kalachar in Chennai. He was conferred the title ‘Kalaimamani’ by the Tamil Nadu Government in 2007. Don't miss this amazing Classical Night ..